As multi-year sea ice continues to disappear at a rapid rate, vessel traffic in the Arctic is on the rise. This is leading to new maritime concerns, especially in areas increasingly transited by the offshore oil and gas industry, cruise liners, military craft, tugs and barges, and fishing vessels. Keeping all of this new ocean traffic moving smoothly is a growing concern for safety's sake. It's also important to the U.S. economy, environment, and national security. But what happens if there’s a major incident such as an oil spill in this remote region? This month, researchers from NOAA’s National Ocean Service and NOAA’s Unmanned Aircraft Systems Program are taking part in an Arctic exercise aboard the U.S. Coast Guard Cutter Healy that is part of an annual effort to ensure the Arctic remains a safe, secure, and environmentally protected region. During the month-long ‘Arctic Shield’ mission, the USCG’s Research and Development Center will simulate an oil spill once the Healy makes it far enough north to test technologies at the ice edge. 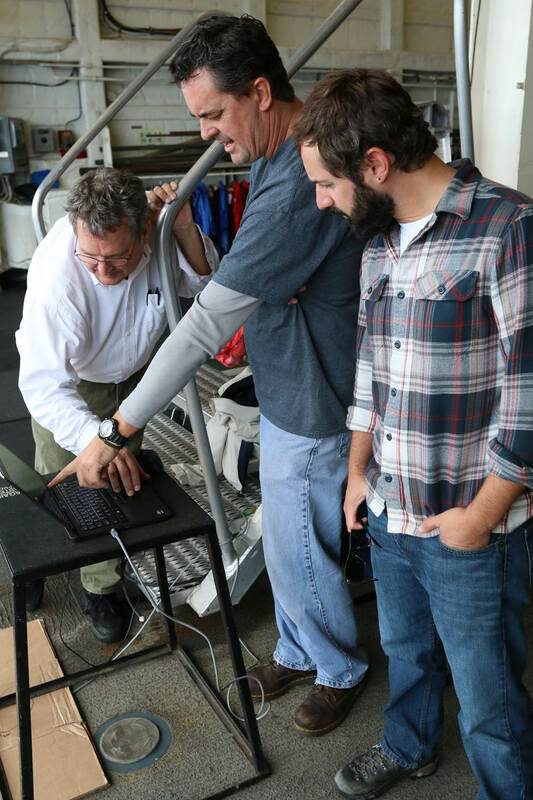 The team will test a variety of technologies, including unmanned airborne and underwater sensing platforms. The NOAA components of this exercise focus on testing technologies to improve oil spill reconnaissance and mapping to enable faster and safer decision-making while operating from a ship—a likely platform for responding to a spill in the Arctic due to lack of infrastructure and accommodations. By weight, 75 percent of U.S. international trade moves through the nation’s ports and harbors. Those ports support, directly and indirectly, more than 13 million American jobs. NOAA provides environmental intelligence to support safe, efficient, and environmentally sound navigation through U.S. ports. NOAA produces the nation’s nautical charts, which provide essential navigation information such as water depths; locations of dangers to navigation; locations and characteristics of aids to navigation; anchorages; and other features. NOAA also integrates ocean and coastal observations, data, science, and services to provide actionable information, thereby improving informed choices. Good decisions today protect lives and property tomorrow. The agency monitors, assesses, and distributes tide, current, and water level products and services. Positioning information from NOAA provides a highly accurate, precise, and consistent framework to help mariners safely navigate around obstructions in our nation's busy waterways. NOAA’s role warning coastal areas of hurricane threats is well known, but the agency also plays a significant role after the storm. NOAA moves quickly to help reopen ports. Navigation response teams survey ports and channels, searching for submerged debris and other dangers to navigation. NOAA aerial photography helps the public, decision makers, and insurance adjusters assess the extent of storm damage. In addition, NOAA's Physical Oceanographic Real-time System (PORTS®) provides accurate real-time oceanographic information, tailored to the specific needs of local maritime communities. Knowledge of the currents, water levels, winds, and density of the water can increase the amount of cargo moved through a port and harbor by enabling mariners to safely utilize every inch of dredged channel depth. For example, an economic study showed that the Tampa Bay economy receives more than $7 million a year in savings and direct income from PORTS®. A second study calculated $16 million a year in savings for the Houston-Galveston region. June 8 is World Ocean Day, a time to celebrate the ocean which covers most of our planet. The ocean—it’s blue, deep, and full of strange-looking forms of life. But beyond its natural beauty and mystery, the ocean is useful to have around for many practical reasons, such as: past ocean life produced enough oxygen to make this planet a nice place to live; it affects the atmosphere, and therefore, the weather and climate; it is full of food humans like to eat; it is fun to play in; and it has lots of materials and mineral resources we use for energy, manufacturing, and transportation. What is the best way to give your thanks for the many benefits the ocean offers us? By protecting it and keeping it clean, of course. Avoid plastic in your face scrub—those tiny micro-scrubbing beads are likely made of plastic and may end up in the ocean. Learn about your relationship with oil—and the many forms it takes in your everyday life. Get cigarette butts off the beach—all 52.9 million of them. Volunteer for the International Coastal Cleanup in September, find a local World Ocean Day event, or join or organize a beach cleanup at a lake, river, or shoreline near you. Make for happy salmon and other fish that live in both the ocean and rivers by supporting community-based habitat restoration where you live.